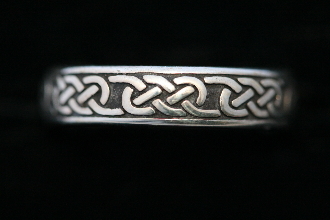 Our Products >> KNOTWORK BAND RINGS >> "Lady Lovers knot"
This is an excellent choice for women who are really wanting a nice lovers knot band ring that is not too bulky, but more of a clean design in a nice medium width (5mm). This design matches the Mens version and the super petite 3mm version. Do not be fooled by the larger looking (rough) photo, as this band is built for the Ladies!